WASHINGTON, D.C. (April 5, 2013) –The National Association of Black Journalists (NABJ) announces the selection of USA Today's Yamiche Alcindor as the 2013 Emerging Journalist of the Year Award recipient. 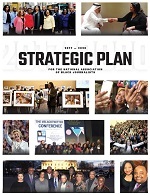 Selected by the NABJ Board of Directors. Alcindor is one of several honorees who will be recognized this summer at NABJ's 38th Annual Convention and Career Fair, the largest annual gathering of journalists of color in the world. Alcindor is presently a breaking news reporter at USA Today and has reported from the scenes of some of the biggest stories in recent memory. In 2012 she traveled to Sanford, Fla. to cover the Trayvon Martin story, to Tallahassee, Fla. to cover the Florida A&M University hazing scandal, and to Newtown, Conn. to cover the Sandy Hook Elementary School shooting. 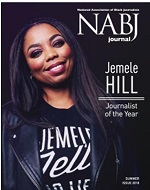 "It is inspiring to see young journalists like Yamiche take advantage of every opportunity presented them to learn, to grow, and to thrive," said NABJ President Gregory Lee, Jr. "This is surely just the beginning of what will be a richly rewarding career for a talented young woman." Considered a "NABJ Baby," Alcindor was NABJ's summer intern at The Seattle Times and was a participant in the prestigious NABJ Student Projects, a multimedia-reporting project which allows student reporters to cover the association and the NABJ convention. A Miami, Fla. native, Alcindor is a 2009 graduate of Georgetown University where she was a Patrick Healy Scholar and a member of Alpha Kappa Alpha Sorority, Inc.
As a college student she interned at The Miami Herald, Mmegi, a Botswanan newspaper, washingtonpost.com, and at The Washington Post. Her career began as a reporter at Newsday where she worked for two years. "Yamiche embodies what the Emerging Journalist of the Year Award stands for," said CNN's All-Platform Journalist Sarah Hoye, who is also NABJ's Student Multimedia Projects Manager, former SEED Co-Chair, and past recipient of the Emerging Journalist of the Year Award. "Engaged, curious and intrepid, Yamiche is a young and talented journalist with great promise who has distinguished herself in the field with her tenacious reporting and compelling storytelling." Prior NABJ Emerging Journalists Award recipients include: Errin Haines (Washington Post); Mara Schiavocampo (NBC News); Sarah Hoye (CNN); Michael Feeney (NY Daily News); Trymaine Lee (MSNBC.com); Kimberley A. Martin (Newsday); and Gerrick Kennedy (LA Times). Alcindor and other honorees will be celebrated at the association's Salute to Excellence Gala, to be held August 3, in Orlando.